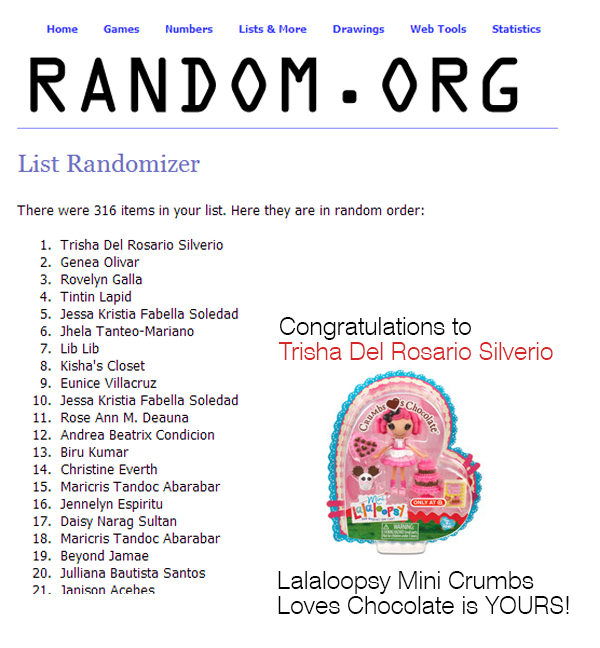 The Lalaloopsy Crumbs Loves Chocolate Giveaway is over. So, it is time to check on your entries. But you have to give me some time because there are entries in my Facebook Page and from Rafflecopter. I still need to finalize the list of valid entries. Okay mommies? I am very happy that many of you joined this giveaway. I hope that somehow, my blog have given you inspiration, information and entertainment..lol. Well, look forward for more giveaways! Keep on visiting my blog mommies and little loves! I still have so much stuff to share. :)I'll be glad to hear from you, too. Don't hesitate to drop in some comments in my posts. Thanks loves! I'll be posting updates about this giveaway soon. Good luck to all of you! 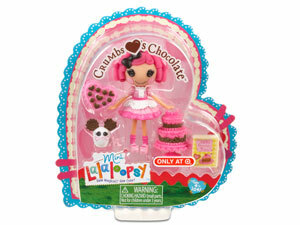 Who will be the lucky winner of Lalaloopsy Crumbs Loves Chocolate? We will find out soon. Congratulations Mommy Trisha Del Rosario Silverio! I can already see a happy little lady waiting for this Lalaloopsy at home. Please contact me within 48 hours for your shipping address. But the item is still on its way to the Philippines and will arrive on April 22. It was suppose to arrive on the 30th of March but then there were some delays. Please send me a private message in PHS's Facebook Page. Congratulations to the winner! Thank you mommies for your support for this first giveaway. We still have a lot more giveaways for the next months. Stay tuned and thank you for your continued support for my blog. Love love love.